“Where is Mrs Parker?” asked the headmaster. “Problem with her chest,” said my dad. I was at an interview for a precious place at Dame Alice Owen’s grammar school in Islington, the best school for miles. It was 1955 and I was eleven. Truth was that my mother was in hospital with TB, but my Dad wasn’t letting on. He was proud enough for me to have scraped through the eleven plus, and wasn’t about to blow my chances by scaring the headmaster into thinking that I might infect the whole school. That’s how TB was thought of then. I must have looked puzzled sitting there in the oak panelled Edwardian headmaster’s study, because my mother’s TB wasn’t talked about, out loud, in my house. For months I had no idea even where my mother was, except that she was in hospital and was so sick that I wasn’t allowed to see her because, if I did, I might get sick too. I missed her as much as any eleven year old kid would. I couldn’t even speak to her. There were no mobile phones then — in fact, no phones at all, as the only person we knew with a phone was the fish and chip shop owner at the end of the road. “Is it serious?” asked the headmaster. “No, expecting her home soon,” said my dad, confidently. “That’s good,” said the headmaster, ticking a box with his fountain pen— and I was in. When my mother had become ill, I would try to listen in to conversations between my grandmother and my father. Elsie had “problems with her chest.” She had been overworking as a sewing machinist at the local dress factory and my dad blamed the hours she had to work and the working conditions at the factory. There were no goodbyes when she was admitted to hospital. I came home from school to our flat in Canonbury and she was gone. For a while my Dad tried to cope, with the help of our next door neighbour, but it was hopeless, so I was soon bundled off to Holloway to stay with my grandmother. “Your mum’s got pleurisy,” my grandmother explained. Behind her, my father shook his head and said, “TB”. “Call it what you want,” he said. TB wasn’t acceptable to my grandmother. It was a disease for poor people. We were staunchly working class and hardly well off, but everyone had a job and so in her eyes we weren’t poor. To the British working class this was an important distinction. And TB was not to be mentioned. For my grandmother, and my mother, too, her illness was something to be ashamed of. 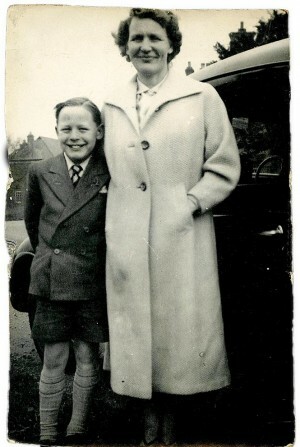 At first I slept on the landing at my grandmother’s on an old jumbo feather mattress that sent me to sleep in seconds and, preparing for a a new school, I almost forgot about my mother who, very soon, had been away for six months. My dad at first tried to cope on his own, but then moved in with us at Holloway. My grandmother vacated her bedroom and I shared with my dad. An unpleasant man at the best of times, he didn’t get on with my grandmother. She would put his dinner in front of him every evening, but the two rarely spoke. After my mother had been away for eight months, my dad announced, with a beaming smile, that he had borrowed a car from work and that we were off to see her. Elsie had been moved to a convalescent home in Winchmore Hill and although I still couldn’t actually meet her, he would drive the car round the back of the hospital and she would come out onto the small balcony of her ward. I remember she appeared and I had no idea what to do. “Wave then, stupid,” said my dad. I waved vigorously and smiled a lot. “Show her your badge,” said my Dad and I pointed to the gold Eagle badge on my lapel that I’d won in a competition from the Eagle comic. There’s no way she could have seen it, of course, but I pointed anyway. My mother managed a small wave and then vanished into her room in tears. “Better go, then,” said my dad, rather matter-of-factly. This sad tableau was repeated each weekend until she finally came home after ten months. When we all returned to our flat in Canonbury, life was much as it always had been. My mother, however, had changed. For a start, she was a hygiene looney. Her own knife, fork, spoon and cup were never to be used by me or my father. And when she hugged me, which she often did, it was with an iron grip that also kept me apart from her and never again did she ever kiss me. She must have thought of herself as a human time bomb, who, although cured of her disease, was completely stigmatized by it and thought that any close contact might infect myself, and I assume my father.